The notion that there is a relationship between the emotional and psychological wounds that we bear and the inherent gifts that we are to bring forth into the world, is embedded in art, story and myth, ancient and modern, the world over. Greek mythology brings us the story of Chiron a centaur, who experiences his first wound as an abandonment at birth by both of his parents. He is then adopted by Apollo and grows to be a powerful teacher to many of the renowned Greek heroes, including Hercules. Upon, an accidental injury, with a skirmish that involves Hercules, he is struck by a poisoned arrow and receives a permanent injury. Due to his immortal nature and the suffering he must endure, he chooses to sacrifice himself, exchanging his immortality with Prometheus to be released from eternal pain. In turn Zeus honors Chiron by making him eternal in the form of a constellation. Carl Jung speaks of the archetype of the “wounded healer”, which links back to the aforementioned myth and traditional shamanic cultures. The shaman, or medicine man of a tribe is born or comes down with a debilitating disease, affliction, or possibly a mental illness. This forces him to discover a pathway to healing by facing his own death or madness. Through the transformative process of their personal healing journey the person is then imbued with ability to cure others. In the Celtic tale of the Fisher King and the Holy Grail, the king is wounded by being impaled through his testicles, thus symbolizing a wounding to his sense of potency. The only relief he experiences is when fishing, signifying when he is doing reflective work on himself. We see this idea portrayed even in the modern tale of Harry Potter. The book’s protagonist carries a scar on his forehead that he received as an infant from Voldemort, the dark lord of magic. The pain of his scar is a constant reminder for him of the violent act that took his parents from him and the difficult task life is asking him to pursue. 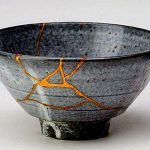 Kintsukuroi, meaning “to repair with gold” is a traditional Japanese artform, where broken pottery is mended with veins of gold lacquer. The repaired piece is considered to be more beautiful for having been broken. Gold in mythology is symbolically considered to be a representation of one’s gift or genius. Initiation, which served as a transition from boyhood to manhood, in the vast majority of indigenous cultures around the world, would often leave a man with actual physical wounds on his body. The scars left behind serving as a reminder of the man’s rebirth into conscious adulthood and the confrontation with his own death he had to face in order to mature into being of service to his tribe. This concept first came into my life in my early 20’s when I partook in a year long intensive rite-of-passage experience with a group of men in Southern, CA. What led me to this work, was the ending of one of my first significant relationships with a woman. The sense of despair, confusion, heartbreak, and anger arising from the experience was heavy for me, and I was struggling to make sense of what had occurred in it all and what I was supposed to do with my life. Finding this group of men to help disentangle me from the unconscious enmeshment I had found my way into with this woman, was critical. I came into that circle of men not knowing who I was or what my value was. I spent my adolescence and the entirety of this relationship trying to get away from the parts of me that I could not accept, and hide them from others. I was existing as a fractured and adulterated version of my true self, that I hoped would be deemed good enough for the world someday. A few months into the initiation with this group of men, we were guided through a powerful process by our mentor and facilitator Francis Weller, a Bay Area psychotherapist who was trained through the lineage of Malidoma Some, a traditional African shaman turned scholar, and author. The process was designed to elicit what they considered to be our “medicine”. This medicine according to the teachers, was our sacred gift and our responsibility to share with the world and our community. As I witnessed the men before me being led into deep places inside of them, where their wound lived side-by-side with their gift, I was both in awe and utterly frightened of the possibility that during my turn, I would discover nothing there. I began the descent into the underworld of my own psyche, where I was to visit the room inside which lived my wound. I crept slowly, cautiously down stone steps towards a, dank cellar that felt like a prison. I was terrified to discover what might be there. And I certainly didn’t want anyone else to know what it was. I arrived at the bottom of the long stone staircase, and saw huddled in the corner of a hard, windowless room, a figure hunched over, facing the wall. My first impression of what seemed to be a hairy beast, frightened me. As I was guided to move closer to this creature, he turned and looked toward me. His gaze was downcast in my direction, but I saw him fully now, completely covered in hair, head to toe, including his face. He was hideous to me and I did not want to be in the same room with him. He glanced up at me and I caught his eyes. I couldn’t keep from being transfixed for a moment. Instead of the evil coming from his eyes, that I had expected, I saw kindness, innocence, sadness. I saw my own eyes. I saw the shame that I kept hidden. The parts of me I didn’t want anyone to know about. I saw a longing to be seen, loved and accepted. I was guided to go to him, pick him up take him into my arms, and place him on my shoulders. As I did this there was a reluctance, like that of an abused animal. He didn’t trust me to take care of him. I made a solemn promise, to the best of my ability to care for him, to love him, to hold him close to my heart. From there, I looked around the room to see that a door had appeared that I was unaware of before. I was instructed to go through this door, and that on the other side I would find my medicine. I hesitated again feeling the fear that the room would be dark and empty, much like the one I was now standing in. I opened the door, shielding my eyes and holding my breath at first. Slowly, I began to gaze around and take in the scene that lay before me. I was in disbelief. It was not just a room but an entire land. A beautiful, bountiful country, filled with golden light, like I had never seen before. There was music coming from the hills, children playing, laughter echoing, birds soaring. Joy poured forth from this place. I felt this richness and robust power that made me giddy inside. I felt at home, in love, at peace, welcomed. I didn’t want to leave this place. I was reminded I could come back and visit here anytime, because this land belonged to me. Making sense of and integrating what I found that day 15 or so years ago, has taken time, patience and has required a greater understanding of the relationship between wound and gift and how they tend to play out in a man’s life. Going into it I had found myself following the romantic fantasy that once I discovered my gift, I would be healed and everything would fall into place. It hasn’t happened quite like that. Michael Meade, an author and speaker, whose work is largely about distilling the meaning from myth, claims the first wound is when the soul enters the body at birth, that movement from the eternal realm to the timebound realm. The longing we have to reconnect with the eternal, or the divine, is an ache that many men will carry for a lifetime. We are also wounded by our family of origin. By design they are incapable of fulfilling all our needs, which we requires us to “leave home” or differentiate at some point. This leaving is where the role of mentor traditionally would come into a young man’s life and support him in the process of healing and exploring the wound. Think Mr. Miyagi in the movie “The Karate Kid”. Meade claims, we don’t necessarily ever heal the wound fully. What’s more true, is that as the gift expands the shadow of the gift, the wound, also expands equally. By design this reciprocal relationship as it continues over a lifetime, serves the function of bestowing the practitioner with humility, which disallows the ego from stepping in to distort the gift-giving into becoming a self-serving function. This pattern is often seen in pop culture. When someone extremely talented, like an athlete or musician, has a rise to fame and they become a star in people’s eyes. We are witnessing them in their genius, their gift, their gold. Consequently they wind up falling into some great difficulty; depression, drugs, suicide, most likely because they are not tending to their wound in a conscious way. Men are notoriously fixers, so the concept of a wound that never heals might be difficult to grasp and frustrating. For myself, in the places where I struggled in life, I often sought the solution. I looked for ways to change or get rid of what I didn’t like. The real work for me has been tending to the wound as a devotional practice. This practice at times has come in the form of simply being able to sit and be present with the “little me”, where my tendency to escape the pain would be to disassociate with busyness or substances. I have also had moments in my life where in the suffering I was experiencing, there was a more immediate transformation of the wound into a gift. These moments occurred when I let down my guard and allowed myself to be witnessed in my suffering and grief by community. The vulnerability underneath my shame revealed an innocence that was completely trust-able, bestowing the gift of opening the hearts of those that were there to receive and witness that pure, raw expression. Learning to love the unloveable and to accept the unchangeable is the process that has allowed me to begin to arrive fully into my skin and land in a place of wholeness. In this wholeness the flow of my gifts into the world has become more organic. Knowing my wound intimately has also led me to the greater gifts that are my purpose. Those unmet needs that have been so painful to me, have guided me to be in service to providing an experience of those things to the world, through my work. The need for belonging, the need to be held intimately by a greater community, the need for loving guidance and mentorship, the need to be accepted in the places we are most in pain and ashamed, these are the foundations of the work I now do with men. I have also discovered that in a true giving of my gift, the healing flows in both directions, to the person receiving it and to the wound from where it came. The work of exploring the wound is not an easy path, yet if we don’t have the courage to turn and face our wounds, we will spend a lifetime running from them. In turn, they will run our lives unconsciously, and we may never know our greatest gifts. Soma Miller has been challenging the status quo since he was in diapers. This man was born with a mission to question the “normal” and seek out the missing links to establishing a consciousness driven ideology of world order that is whole-hearted and relationship-centric. His current aim is facilitating the development of the visionary leaders of the future, training them in integral skillsets for leading us out of planetary collapse and towards a symbiotic and ecological future. The tools that he practices with and teaches through his business, The Essential Man are helping to redefine misguided concepts of masculinity. His systems thinking intellect and lofty goals for cultural change have led him to be a student of a diversity of pathways, seeking the interlinking patterns in all the traditions. These have included the study of ecological design methodologies, yoga, sacred sexuality, meditation, music, integrative nutrition, and shamanism, making him a creative renaissance man, that’s sometimes difficult to pin down. He’s known for his stubborn persistence, crass sense of humor, penetrating depth and sincere desire to awaken the genius in everyman. Soma’s multi-disciplinary approach to coaching weaves together a path of integrated leadership and masculinity in balance.